String Studio VS-3 combines two independent timbres, stacked or split, to create performance friendly, texture rich, and spacious sounds that will make a lasting impression. 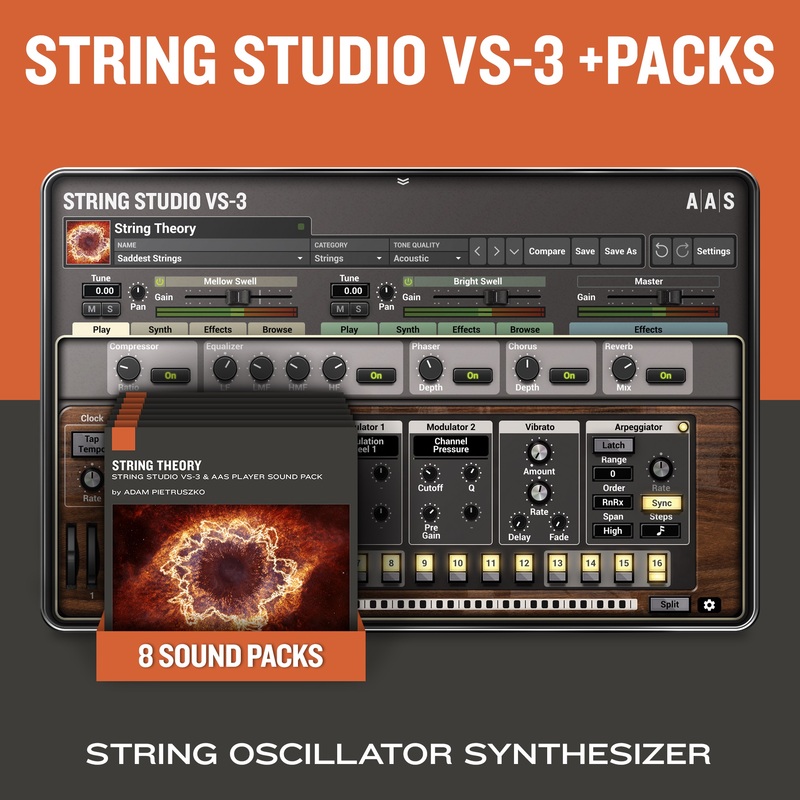 Consisting of picks, bows, hammers, fingers, frets, and dampers, the string oscillators of String Studio VS-3 radiate a unique blend of modern and creative synthesis. Augmented with classic filters, envelope, LFO, soundboard, and studio-quality effects, String Studio VS-3 offers an intriguing balance between innovation and familiarity. String Studio VS-3 provides an abundance of effects in three independent racks. The on-board reverb, delay, distortion, phaser, chorus, flanger, filters, equalizer, compressor, guitar amplifier, and tremolo all assist in achieving your perfect sound. String Studio VS-3 now boasts two performance modulators per layer that respond to user-defined MIDI controls. Every sound features effect and morphing assignments that can be played in real time for enhanced expressivity and sonic dimension. The String Studio VS-2 + Packs run in both 32- and 64-bit on Mac OS X and Windows making them compatible with nearly all DAWs.